Halswell Quarry is a deservedly popular spot to visit. With more than 60 hectares to explore, it offers a really interesting mix of activities: picnic spots, walks, mountain biking, historic sites, botanical gardens, wetland ponds, a dog park, and of course, the quarry. Tramping over the troll bridge was a highlight. Access is off Kennedys Bush Road and there’s plenty of parking. Gates open at 7 am all year round, and close between 6 – 9 pm depending on the time of year. See below for a location map. There are toilets and drinking fountains. The information centre is closed due to earthquake damage but there are very good information boards around the park. The quarry opened in the 1860s and closed in the 1990s. Many of Christchurch’s prominent buildings have been built from Halswell quarry’s distinctive blue-grey stone, including the Canterbury Museum and Provincial Council Chambers. We visited Halswell Quarry in May 2015 (autumn). 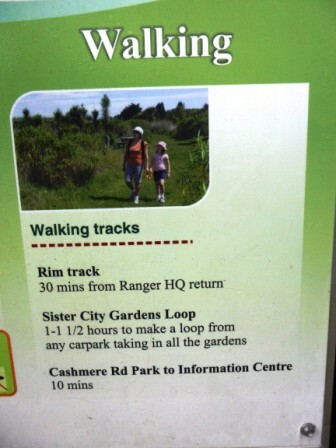 Sister City Gardens Loop – 1 – 1.5 hours to make a loop from any car park taking in all the gardens. The Crocodile Track – a moderate, shared mountain bike and walking track (closed August and September). The Road/Quarry/Crocodile loop takes around an hour to walk. The Crocodile Track begins near the dog exercise area in the quarry and ends at the beginning of the Kennedys Bush track at the top of Kennedys Bush Rd. Kennedys Bush Track to the Summit Rd – access this track from the top of Kennedys Bush Rd or from tracks going up from Halswell Quarry Park. It takes about 1-1.5 hours to walk from the top of the road to the Summit Road, where you will find tracks in several directions to places further afield. A challenging but fun walk up to the lookout for little legs. Our kids wanted to do it twice! 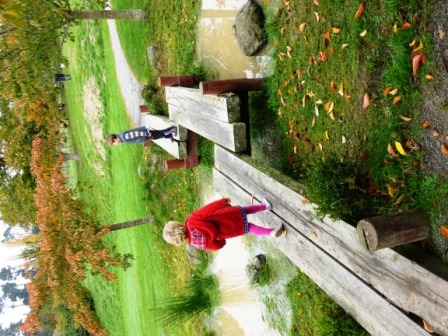 Path up to the lookout – get the kids to count the steps! There are six unique gardens designed to represent the character and beauty of Christchurch’s sister cities: Adelaide (South Australia), Christchurch (England), Gansu Province (China), Kurashiki (Japan), Seattle (USA), and Songpa-Gu (Seoul, Korea).